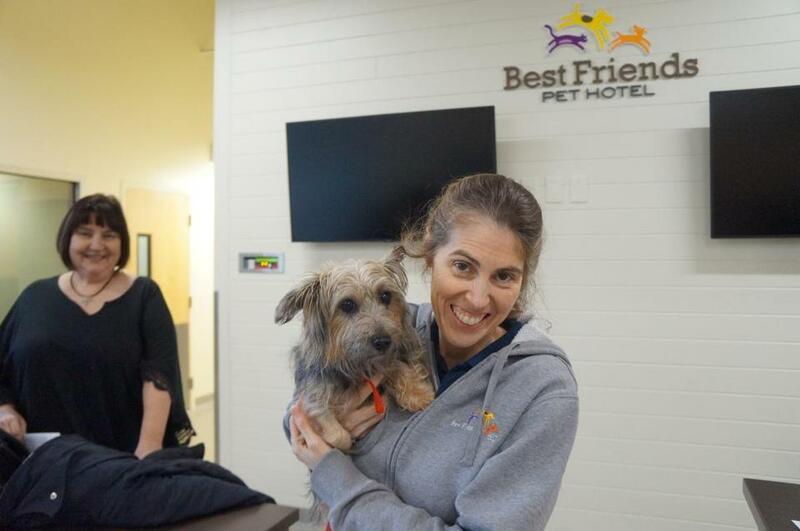 Becky Powers, manager of the new Tyngsborough Best Friends Pet Hotels, recently showed the first pet guest, “Libby,” around the new hotel, grooming facility, and indoor/outdoor doggy day care areas. Pictured in the background is Best Friends Pet Hotels district manager Agni Sarmaniote. Spring break isn’t just for humans. Spoil the family’s favorite furry friends at the Best Friends Pet Hotel in Tyngsborough. Pets can stay overnight at 2 Technology Drive in a 9,000-square-foot facility with luxury suites, grooming services, and camps for dogs and cats. Imagine pets scampering around a splash park or a yard. Proof of vaccination precedes any vacation, though. Contact 978-649-8585 or visit www.bestfriendspetcare.com. Wood Hill Middle School students in Andover participated in the national initiative “No One Eats Alone.” The program asks students to engage with others who may be eating alone and to offer kindness to peers during lunch. At the end of March, sixth- to eighth-graders at Wood Hill conducted their own event with a photo booth, family-style lunch, and get-to-know-you games that ran during three separate lunch periods. Members of Lowell High School’s class of 1969 can get ready to relive their teenage years at their 50th reunion Aug. 16. Half a century flies by and organizers want all alumni from near or far to spread the word and make an appearance. The Reunion Committee is brainstorming activities like a tour of the high school, a Spinner’s baseball game, and a performance by the Beach Boys. Tickets cost $50 and will go toward the Lowell High School Class of 1969 Scholarship Fund. Group rates will be offered at the Radisson Hotel in Chelmsford. Contact shartigan1969@gmail or 978-995-3637 for more information. Survey the plethora of crafts and fine artworks made by eight artists at the Marblehead Arts Association Artisan Shop. The opening reception heralds this season’s chosen artists, which switch every three months. Most pieces for sale cost less than $250. The free reception takes place April 25 from 5 to 8 p.m. in King Hooper Mansion, 8 Hooper St., and promises an opportunity to speak with the artists and enjoy light refreshments. The sale itself runs from April 20 to July 14. Visit www.marbleheadarts.org or contact 781-631-2608 for more information. Forty Salem State University students spent their spring break volunteering in Louisiana and Missouri. The students split up by location and worked for local communities through the St. Bernard Project, a disaster relief organization, and Habitat for Humanity, a charitable house-building organization. The annual trips are sponsored by the student-run Community Service Initiative. The program runs again next year. Contact service@salemstate.edu or visit salemstate.edu/clubs. Annika Hom can be reached at annika.hom@globe.com. Follow her on Twitter @AnnikaHom.